Jesus was using a word here that fishermen frequently used in reference to their everyday task of continually casting out their nets to find fish. It isn't simply a one-time event, it's something that you have to do over and over again if you want to get fish. Why? Often the net comes up empty, or sometimes with only a few fish in it. I enjoy crabbing, and when I drop a crab pot into the water, wait 15 minutes or so and reel it back up again, most of the time it doesn't have a huge, juicy crab in it ... usually it's something I really don't want, like a starfish or some other inedible bottom-dwelling creature (if anything). So, in order to catch a crab or two, I often have to re-bait the trap and drop it again. Keep on casting, until I find what I'm looking for. 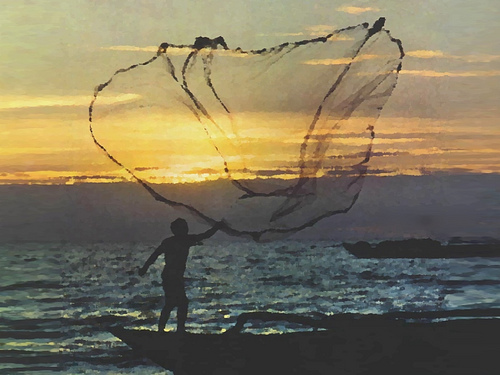 So why do we have to keep on casting that net of cares to God? Why does it sometimes come back empty, or with an answer we didn't expect? After all, "He cares for us," right? Why doesn't He simply fill it up with the answer that we are looking for? I think the reason is that God knows that fishermen need to be about the business of fishing. If on the first cast of the day, He filled up their nets with large, juicy fish, what would they do with the rest of their time? Probably nothing good. Maybe spend all day drinking margaritas on the beach. Which sounds nice, but what fishermen really need to be doing is fishing. 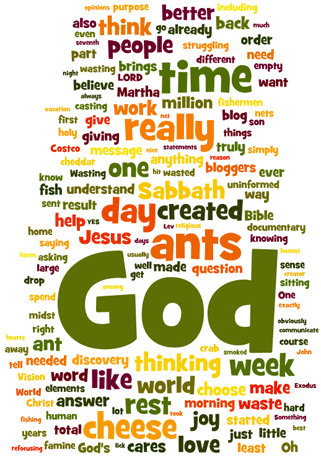 And what we as God's children really need to be spending our time doing is talking with God. 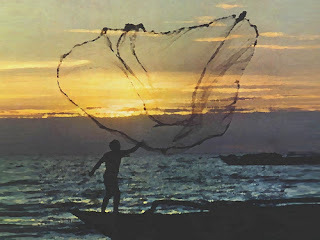 Casting our nets keeps us connected to Him, instead of laying on the beach and wasting away in Margaritaville. Jesus said to Martha, who was distracted by all her responsibilities and angry at her sister Mary for sitting at Jesus' feet and listening to Him while Martha toiled away: "Martha, Martha: You are worried and upset about many things, but few things are needed, or indeed only one. Mary has chosen what is better, and it will not be taken away from her." In the midst of all our cares, we have a choice. We can be distracted and upset by them, or we can "cast them upon Him" ... choosing to sit at His feet and listen to what He says. What will we choose today? Wallace & Gromit, move over!